For as long as I've owned a Macbook and an iPad (read: two years), I've been searching for a way to connect the two together, marrying touch sensitivity and portability to a proper operating system in some kind of post-Jobsian tech utopia. And as long as I've been trying, every half-assed solution has sucked — until now. Astropad is a pretty basic concept: download an app onto your Mac and your iPad, and the Mac screen will be mirrored wirelessly onto the iPad, letting you drag and drop and draw without the need for a thousand-dollar pen display. It's an idea that many apps have had before, but they key difference is, they all sucked. Every app I tried before was buggy and laggy, taking ages to set up, only working half the time, and being so slow it was unusable the other half. Astropad's execution is much better, requiring zero setup, and mirroring the display with zero lag and total reliability (you can even use a USB cable rather than Wi-Fi, if you're working offline). It probably helps somewhat that the app's founders are a pair of ex-Apple engineers. 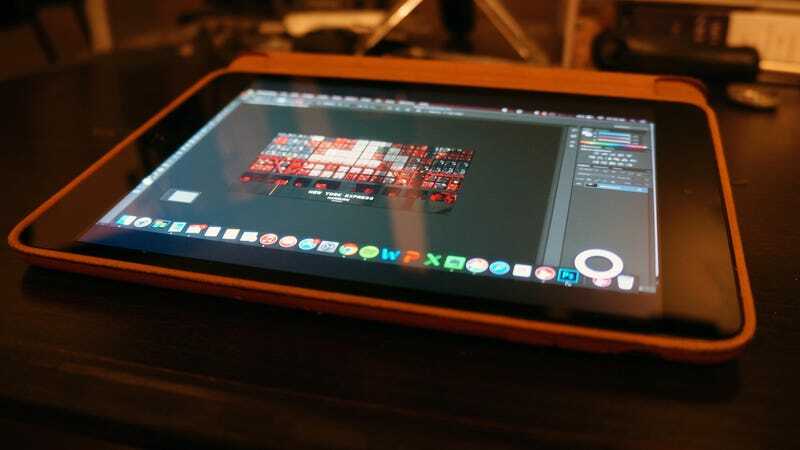 Once you've got the connection up and running, it's clear that Astropad is designed for artists and graphic designers, rather than people trying to completely control a Mac from their iPad. All the details are thought out with something like Photoshop in mind: a toolbar to help you navigate, simple implementation of pinch-to-zoom, and best of all, support for a pressure-sensitive stylus (which you'll have to buy separately). All told, that means that the app should let you replace a pen tablet, or even something like Wacom's Cintiq pen display. I've been playing with the app on my Macbook Air and iPad mini, and while I cannot draw (no seriously: my high school art teacher never managed to successfully teach me to draw a stick figure), I do use a Wacom tablet for Photoshop editing, and the Astropad+iPad combo is better in pretty much every way. Best of all, the founders have hinted that they might bring the underlying mirroring technology, dubbed 'Liquid', into something that would let you use an iPad as a second monitor, rather than plain mirroring.